Potencia frigorífica nominal 230 - 469 kW. 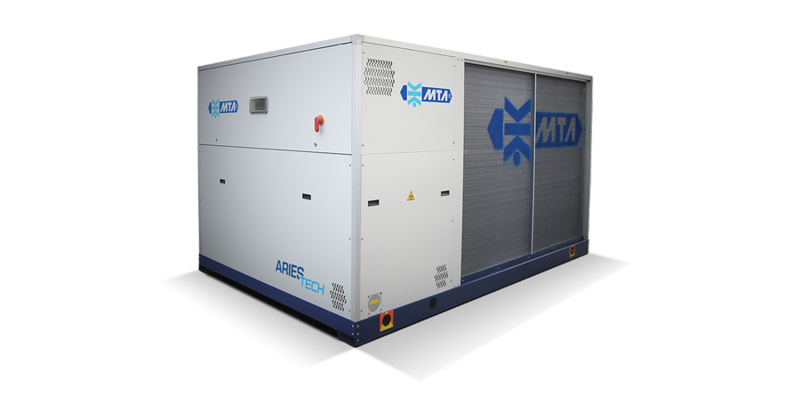 The Aries Tech chillers, with R410A eco-friendly refrigerant, represent the best solution for process cooling applications (such as automotive, plastic, chemical and pharmaceutical, food and beverage, wineries, machine tools, etc. ), offering a large energy saving in all the functioning conditions. The design philosophy is strongly oriented to reduce the operating costs and to protect the environment. The main characteristics of this range are: scroll compressors for an higher seasonal energy efficiency; high efficiency plates or shell and tubes evaporator for an higher full load efficiency; separated aeraulic sections for a more efficient fans regulation related to the thermal load variation; partial and total heat recovery for sustainable use of electricity. The wide range of accessories and versions offers solutions to the most varied of installation requirements and at the same time facilitating installation, start-up and management of the system.